The bug hotel went into the wood a couple of weeks ago. It consists of a pitched roof and currently holds a collection of stick and logs. 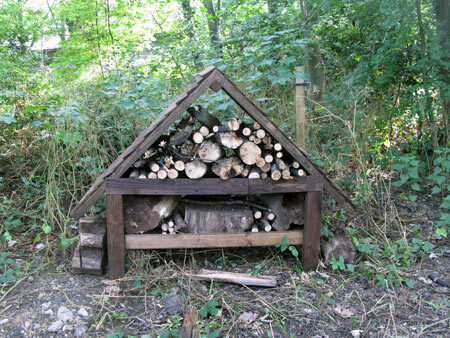 Having looked at other bug hotels online, I wonder if we should diversify our one a bit? We could add some hollow bamboo for bees, some hay and straw, plant pots, plastic bottles, rocks etc. Maybe it could do with a back and some more dividing bits of wood?